According to the newspaper Le Parisien, three Paris restaurants were recently busted for trafficking in cocaine. 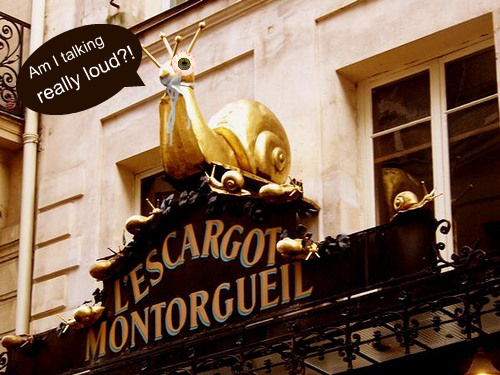 The historic L’Escargot Montorgueil, which has been serving the namesake gastropods for more than a century, has in more recent times been serving rails as well as snails. Along with restaurants Le Baci (owned by Thierry Costes) and La Bocca (the first Paris restaurant owned and long ago sold by Pierre Jancou), L’Escargot is subject to a short-term administrative closure after two dealers connected to the restaurants were arrested with 60 grams of cocaine, € 2,500 in cash and a loaded automatic pistol. We always wondered why the customers at Costes establishments didn’t seem to care that the food was lousy. Now we know! Hmmm, maybe the authorities should look into La Societe in front of St. Germain church. It’s part of the Costes empire. I always see very dodgy looking people there. Hahahahah! That is too funny. Je vais prendre les “escargot menu degustation…” (wink, wink, nod, nod). Looks like Rick Steves and Andrew Zimmern will need to edit their Paris episodes. I could’ve sworn that was salt on the table. But I guess salt isn’t usually served in lines. The caption on the snail made me pee in my pants. Thanks.